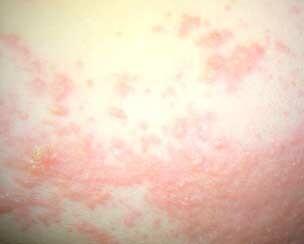 "Eczema refers to an inflamed skin condition. Eczema is also referred to as dermatitis. The most long-lasting and severe form of dermatitis is atopic dermatitis. There are several possible causes ranging from an allergic reaction to something that comes in contact with the skin to allergy where the immune system overreacts to a substance (food, plants, animals, chemicals, allergens in the air such as pollen). As the skin becomes inflamed it produces a substance which causes itch. Other symptoms include crusting, redness, and clear oozing. Itching and scratching can worsen the condition and introduce a bacterial infection. The most common type in children is atopic dermatitis, which refers to an allergic reaction. Treatment involves the identification of the underlying cause, removal of potential triggers such as an allergen, bath soap or laundry detergents, and the use of medications that can address inflammation or allergic response. Eczema is referred to as being acute or chronic. Acute eczema has symptoms such as itch, rash, or redness (erythema) and blistering. Chronic eczema or dermatitis has symptoms such as itch, dry skin, hardened or leathery skin, thickening of the outer skin layer and skin cracking. The condition can last days, weeks or years depending on the form. Atopic dermatitis, which is seen in young children, can last longer than forms that result from an allergen or poison ivy, where the flare-up trigger can be identified and removed." Eczema is a type of dermatitis which refers to inflamed or swollen skin. It can appear anywhere on the body and can be found in children and adults. It is used to refer to a broad range of skin problems that are usually characterized by skin crusts, itch, and pus. "An acute, subacute but usually chronic pruritic inflammation of the epidermis and the dermis, often occurring in association with a personal family history of hay fever, asthma, allergic rhinitis or atopic dermatitis." 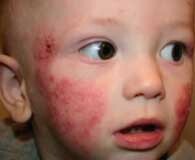 Eczema seen in children is usually caused by atopic dermatitis. This form of eczema has an unknown cause and is often seen in children that have other conditions such as hay fever or asthma. It tends to be seen in families, but not all of the time. Other forms of eczema occur when the skin comes in contact with irritants or an allergen. This can include poisonous plant such as Poison Ivy, or when you change a household cleaner, try on new clothes, use a new shampoo or change cosmetics which causes an allergic skin reaction.  Seborrheic dermatitis (eczema on scalp) in child Also referred to as Cradle Cap. Treated by rinsing scalp with warm olive oil that is left on the scalp for a few minutes. Can also be treated with dandruff shampoos that contain selenium sulfide, salicylic acid. In children, atopic dermatitis or skin inflammation is less severe. In adults, sites affected are often the same as those affected as a child. In general adults experience localized inflammation, and lesions can be dry or oozing with pus. Sites are commonly above and on the sides of the neck, on the forehead, on the wrists, in back of the knee and elbow. Other symptoms can include an upper respiratory infection. Atopic eczema can persist for months to years with all patients having dry skin. Eczema is commonly found in skin folds. Eczema on Arm Due to Allergic Contact Dermatitis. Also seen on neck and legs. Diagnosed to be caused by Poison Ivy which occurred 10 days after exposure. Well demarcated plaques of erythema (superficial skin reddening) and edema (fluid) on which are superimposed and closely spaced small vesicles (fluid filled sac) filled with clear fluid with punctate erosions and crusting. 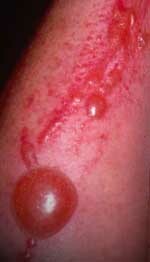 Plaques of mild erythema with small dry scales and or superficial desquamation (skin peeling), sometimes associated with small red, pointed or round papules. Plaques of lichenification (skin becomes hardened or leathery) with deepening of the skin lines with satellite, small, firm, flat or round top papules, excoriations (flaking) and pigmentations or mild erythema (superficial skin reddening). Skin symptoms such as itchy skin, rash or scaliness (for example if there is no itch, the condition is not atopic dermatitis). The Doctor or Dermatologist will also have to differentiate eczema from disorders with similar symptoms such as Scabies, Seborrhea, Psoriasis and contact dermatitis. Dermatologist Jenny E. Murase discusses why people get atopic dermatitis and the benefits of treatment. As mentioned, there are many causes for this condition, with treatments based on identification of the trigger. Once this trigger is diagnosed, a specific treatment plan can begin to address the problem, including avoidance of any allergens, such as changing laundry products or soaps. Patients should avoid scratching. Symptoms will be helped by living in a clean and cool environment with the use of soap substitutes. If food is suspected, the eczema diet and can be changed to an elimination diet where the patient limits the diet to one protein and carb, such as chicken and rice. If the patient improves on a simplified diet, ingredients are added back in until problem reoccurs. Once this happens, you can identify the problem food component. Seborrheic eczema is treated with over the counter dandruff shampoo containing coal tar, salicylic acid, zinc or ketoconazole, or selenium. Lotions containing similar ingredients can be helpful when treating other areas of the body. Corticosteroid cream (over the counter or prescription). Chronic cases may require an oral corticosteroid for use over a short period of time. Antibiotics are used for any secondary infections. Other treatment approaches include antibiotics to treat bacterial infections, barrier creams to avoid contact with the skin, and antihistamines to reduce allergic skin reactions and rashes. Once the underlying cause is identified and removed, healing starts within 2 weeks. For cases of occupational irritant contact dermatitis (ICD), 1/3 of people have 100% remission with the rest having to move to a job where they do not come in contact with the irritant. During and after recovery, a natural homeopathic skin cream such as Skin Dr. may be of some benefit for supporting natural skin immunity and to support skin health.